It is starting to get warmer and warmer here in Georgia. Our days will once again include long lake stays and trips to the pool. One of my family's favorite summer activity is to lounge by and play in the pool. I can't wait until it is warm enough to relax poolside everyday. Having a body of water is a MUST to have a great summer party, in my opinion. I remember SweetPea's first time in the pool. I was so excited and nervous at the same time. I knew a smooth transition into the water could create a life-long love of swimming. Little ones need baby-steps when going from land roamer to pool dweller. That's why it's important to have the right tools to help ease the transition. When we first introduced our babies to water, we always carried them in first. This way they could stay nice and warm up against us. With SweetPea, we started introducing her to water when she was five months old and with Peanut, he was about four. We started slow with each one, took their cues on when they wanted to get out, and didn't rush anything. It can be hard because you know they are going to have fun, but remember that it is a process. We then transitioned to a SwimWays Baby Spring Float. 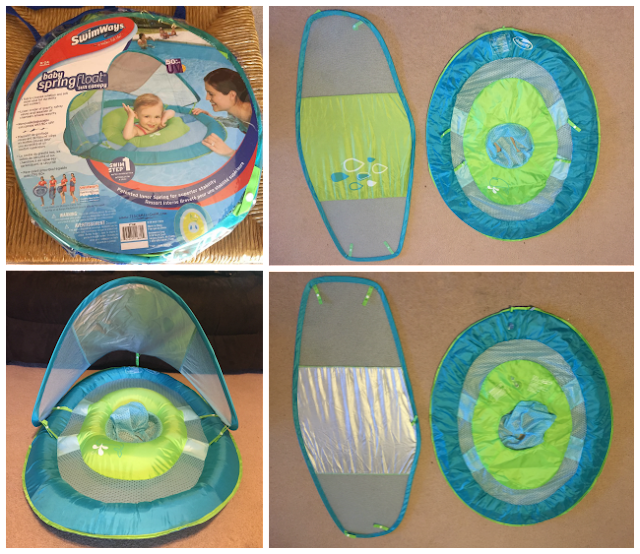 It is a fabric-covered inflatable pool float which has a soft mesh seat. With a lower center of gravity, the Baby Spring Float allows babies to sit in the pool and get use to their new atmosphere while still feeling supported. My son was always so comfortable in his that he would try to fall asleep. We would have to take him out so he wouldn't. Baby Spring Float is the single best baby float on the market today. My favorite part about this float is that you can collapse it to fit in a carry bag, so the float can go anywhere with you. SwimWays has been teaching children to swim for over 40 years, making it easy for parents to share their love of water while building their child’s confidence. SwimWays created the Swim Steps line of products to help children become confident swimmers. You can purchase the Baby Spring Float at ToysRUs. 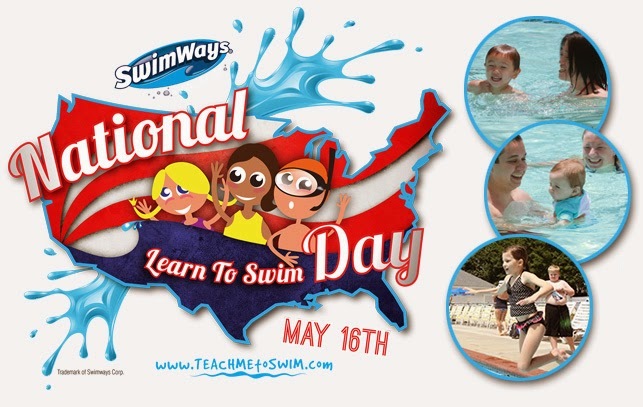 The 4th Annual National Learn to Swim Day is May 16, 2015. This day is designed to remind parents and guardians to kick off summer safely by engaging their children in water safety and swim instructions. SwimWays believes that swimming is an important life skill and that all children should have the opportunity to learn to swim. You can connect with SwimWays on Facebook, Twitter, YouTube, and Pinterest for more info. How did you introduce your babies to water? Do your children know how to swim? What do you think makes any easy transition? The baby pic is so cute!! I like the fact that float is collapsible making it easy to carry along on vacations, with summer coming it is time to visit beaches and outdoors is better than small pool sometimes I feel. It looks comfortable and cover top type will provide shade as well. Thanks for sharing will check this out store next trip. This makes me miss having my babies as actual babies LOL. I remember introducing each one of them to the water. It was comical. Thanks for the great review. I'll share this with my friends with infants! This is so adorable. What a great idea. I love that this is collapsible and fit sin a bag. It will definitely help keep the baby from sun damage too. I would feel very secure about putting my child in this. Looks easy to pack up and carry! Love the sun shade since I'm a water dweller if I get the chance. Now if only I had a tiny baby to play with again. What a cute Water Baby you have there! Even tho we live by the beach, my daughter still isn't that great at swimming. She got plowed by a big wave when she was young and never really wanted to have anything to do with water since! Love the float for the little one! I need one for an 11yr old, think they make one! This is really cute. We don't swim very much. My older 3 kids know how to swim, but my younger 6 do not. I need to get them swimming more often. This would be great for my baby man. My sons are very young and dont swim yet. But, I think its important to get them in the water and used to the water so that they are not afraid of it. As of now, all they do is float with assistance. aww that is such a cute picture! I don't have any children yet, but your tips definitely do make sense. I will have to keep that in mind someday. I've never seen the spring float before. That is really cool to have. This is a great way to introduce babies to the water. Not to mention how adorable it is! I love that you can collapse it and carry it easily. Great product. I love the pics! Thanks for sharing.